I had a friend over for dinner tonight before we went to see the American Dance Festival performance. I decided to make a hearty waterless meal. This is what I did. I put the kale, potato, broccoli, carrot, and red onion into a preheated (medium heat) 3 quart Saladmaster stock pan. I covered the pan and continued to cook at medium heat. Within a few minutes, the vapor lock started to vibrate; I then reduced the heat to low so that the vapor lock wasn't vibrating and let it cook for about 20 minutes. While it was cooking, I blended the onion, miso, ginger, juice and water, salt, jalapeno, and black sesame seeds. When I was ready to serve, I uncovered the pot and mixed in the miso dressing. I also made some Jade pearl rice - I love how it comes out like creamy risotto. I first sauteed (with no added fat) a bit of onion and bell pepper, then added 1 part rice to 1 1/2 parts water, as well as a vegan bouillon cube, brought to a boil, then cooked on a low simmer, covered, for 20m. I mixed in about 3 or 4 ounces of chopped seitan. I served some cucumber slices with hemp seed. My friend enjoyed the meal. I really loved the rice - I don't think I've prepared it this way before, and have to do this for my wife and daughter when they return from their trip. The main course was good; I think this is the first time that I've cooked potatoes waterlessly, and they came out tender and quite good. The dressing really made this dish. One thing that I like a lot about my Saladmaster cookware is that it is so easy to clean. The potato stuck just a bit, but wasn't difficult to clean. However, next time I think I'll put greens and vegetables at the bottom and put potato on top. The main course could have used a bit of garlic (either in the dish or in the dressing). A little bit of finely chopped raw onion mixed in just before serving would have been nice. Squash could have been a good addition. 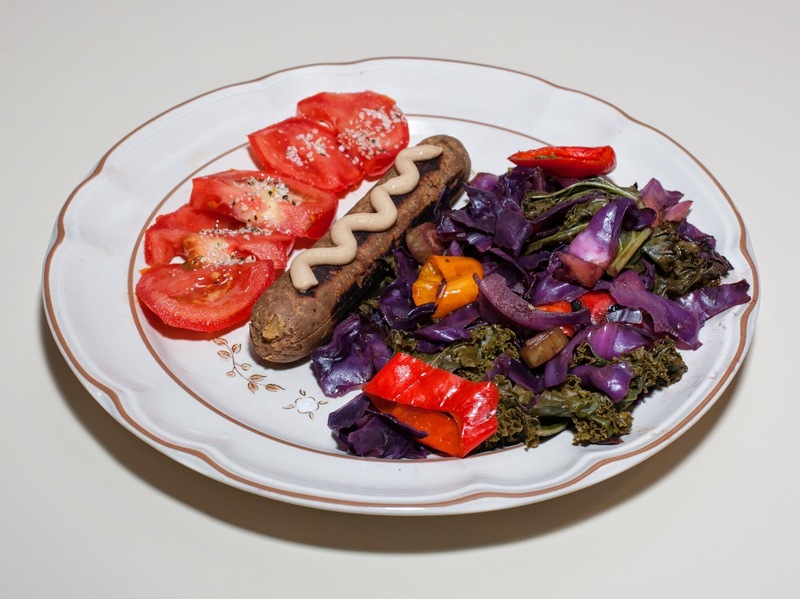 As I described on June 18, I am trying out a local company, The Purple Carrot, that is testing out the concept of delivering low fat vegan dinners as colorful recipe cards and all needed ingredients. I loved the polenta that I made last time and in fact hope to make a polenta dish from scratch again soon. Crunchy carrots, chewy shiitake mushrooms, meltingly delicious zucchini, and green powerhouse Napa cabbage adorn gluten-free rice pasta. The tangy (and optionally fiery) Asian-inspired sauce sets off taste explosions in your mouth. 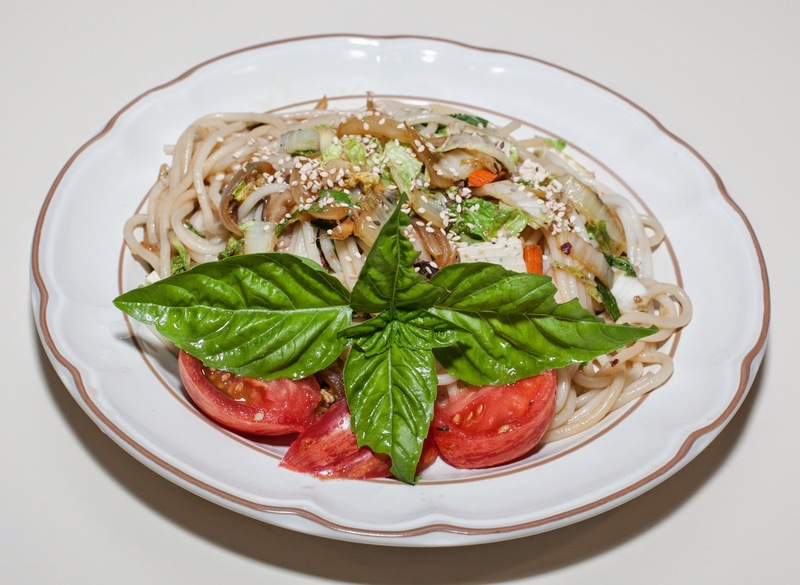 You'll feel full and satisfied, and you can eat tons of Lean and Light Lo Mein without worrying about gaining weight. Win-win! It came out very well! I like working with rice noodles, but up to now all the rice noodles I've used cook quite quickly, within a few minutes at most. These noodles, however, were thicker and took 17 minutes. I enjoyed the spice and the texture. Yum! I thought that I would try another red split lentil dish (Masoor Dhal) like the one that I had made a few weeks ago during my Dad's visit. I had some friends coming over as well, and thought that they may enjoy this. I did something similar to what I did last time, but also included potatoes. I thought that I would cook the lentils (15-18 minutes under high pressure), potatoes (7-9 minutes cubed and 12-15 minutes whole), as well as carrot, corn kernels, and asparagus chunks (any of which take 1-2 minutes) to cook in the Instant Pot. Last time, I cooked the lentils for 13 minutes and then another 4 minutes with additional vegetables. The texture was good so I was thinking of using similar cooking times. For my Dad, I used longer cooking times to ensure a very soft product, but tonight I used a bit less time. The potato wouldn't cook in 2 minutes, so I decided to add the potato to the lentils but cut the potato into large 3/4" cubes, expecting them still to be a bit overcooked. Here is what I did. 2 small shallots (or 1/4 cup onion), cut into a small dice between 1/8" and 1/4"
I put the lentils, potato, water, bouillon cube, turmeric, cumin, and salt in the Instant Pot and cooked in high pressure for 14 minutes. I waited till I had to move forward, then slowly released the pressure. I tried the dish so far - surprisingly, the lentils were done and, of course, the potato was already a bit overcooked. The dish was not very moist, but, as is, was ready to be served as a good course! I added the rest of the ingredients except for the shallot, red onion, and ginger (including a little extra water, as listed above) and cooked for another 2 minutes on high pressure. I actually forgot to include ginger as I was cooking and would have preferred to have added it at the very beginning, but instead we got more pungent fresh ginger. When I was ready to serve, I slowly let out the remaining steam, mixed in the shallot and ginger, and served. My friends' baby apparently eats a bit of spice (I wish that my preschooler did! ), but I still didn't want to add jalapeno to the dish; instead, I had hot sauce for people to add as they liked at the table. 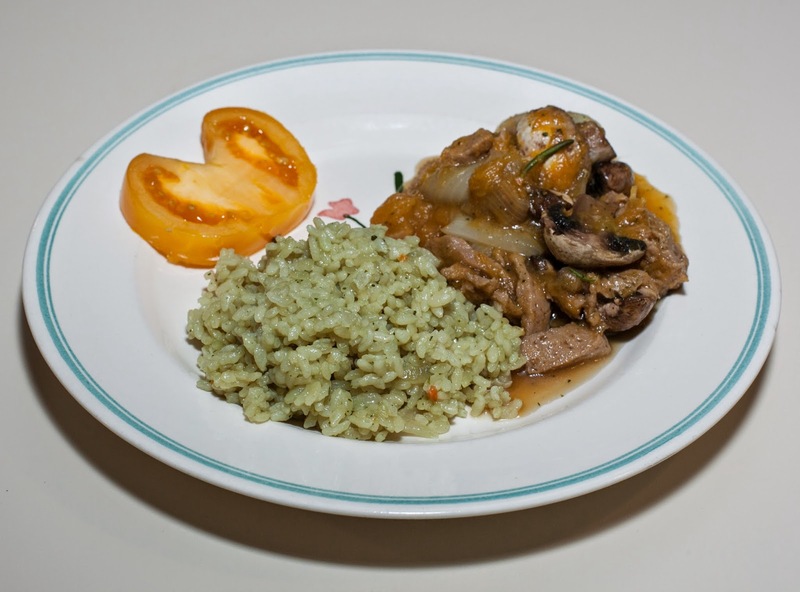 I also served some Madagascar pink rice, sungold golden cherry tomatoes (they're in season! they are like candy! ), cucumber with hemp seeds, and fresh basil from my garden. We all enjoyed dinner. The dish could certainly have been spicier, but was good and hearty as it was. 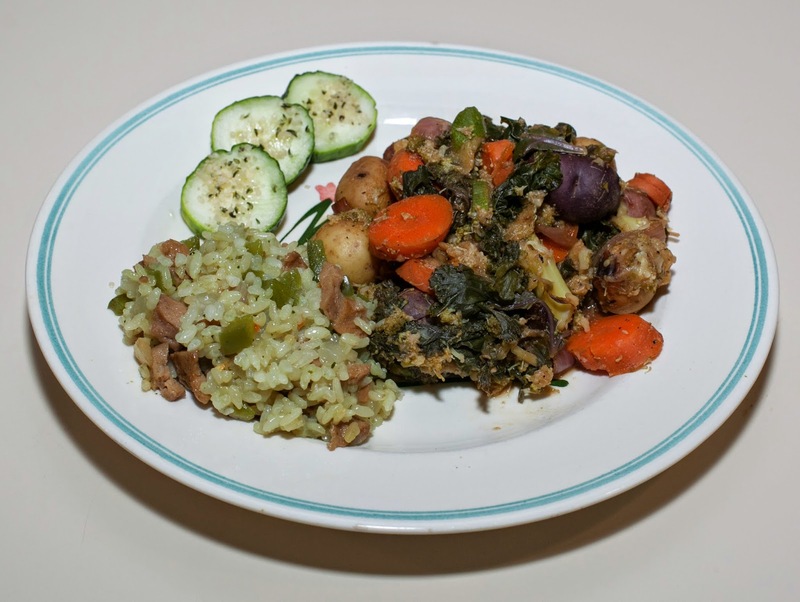 I really like a lentil dish like this with vegetables, and the potato added a nice heft. If not cooking for children, some jalapeno cooked with the other ingredients would be nice. Instead of turmeric, twice as much garam masala could be nice. With the potato, I needed a bit more water in the initial cycle. The end result was definitely like a stew and welcome, but if I want to make something dense enough to serve on a plate, then I might want to add less water in the second cycle. Next time, if I cook lentils and potatoes together, I might want to start with a 1 : 3 1/2 ratio of lentils to water. As long as the intermediate point isn't dry, perhaps the additional two minutes of cooking could be done with no more water, if the desire is for something less liquidy. For something with the consistency of tonight's dish, I might go with the 1 : 3 1/2 ratio initially and then add a little more water to come up with the same overall ratio of about 1:4 (2/3 lentils : 2 3/4 water, or 8:33). Ideally, the potato should cook a little less, but I don't think any of us minded the softness. I did have a few slightly bigger pieces of potato that I liked. Perhaps the thing to do is to put the potato in at the beginning, as I did, for convenience, but cut them into larger pieces, perhaps 1" or slightly larger cubes. It would be fun to try similar dishes with different kinds of lentils. I wonder what the dish would be like with some quinoa or perhaps barley, as well. Other vegetables that would go well in this kind of dish might be squash (some hubbard squash would particularly add a nice sweetness!) and/or raw peas (i.e., added at the end). I was tempted to put just a little bit (maybe 1/8 teaspoon) of cinnamon in for a subtle taste, and should try that in a similar dish in the future. I had an urge for pizza today and picked up a prepared pizza crust that I like, Vicolo Corn Meal crust. I included some black beans and a little bit of Daiya vegan cheese. 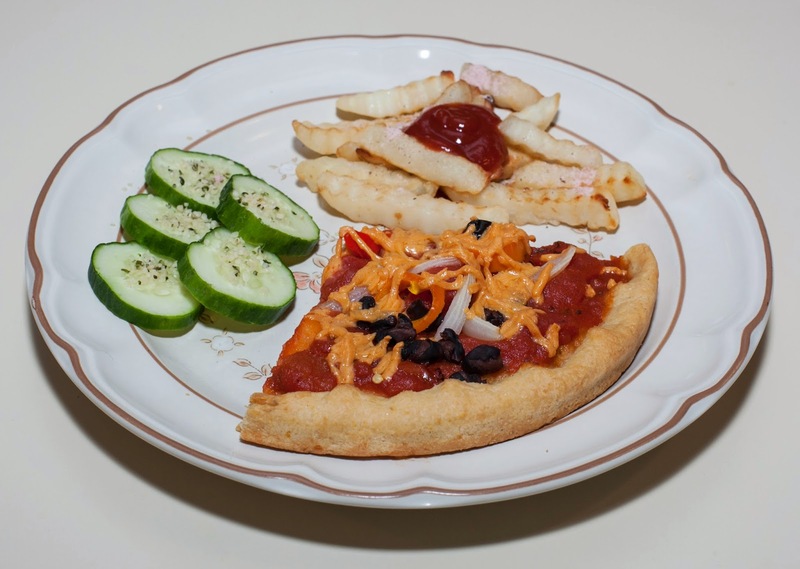 Baked French fries and cucumber with hemp seed completed the easy and tasty meal. My wife and daughter are away for three weeks visiting India. I sure miss them - they are about to arrive in a few hours at my wife's hometown. I don't usually get to cook with tofu since my wife has problems digesting it. Today, I was feeling quite appetized by the idea of a tofu-vegetable saute, and that's what I made. 1/2 of a medium bell pepper cut into strips approximately 1/4" x 1"
I have found that I can brown tofu by cooking it in a cast iron pan with no added oil. I do periodically season my cast iron pans with a bit of oil, rubbing it in over low heat, to keep the pan nonstick, so some tiny residue of oil may seep into the tofu, but it's insubstantial. I preheated a cast iron skillet over medium high; once hot, I added the tofu. Indeed, tofu doesn't stick, as long as you periodically stir. I cooked till nicely brown, maybe 7-10m. In parallel, I put the first batch of onion into a Salad Master stainless steel saute pan (no need to preheat), then turned the range on to medium high. I occasionally stirred; in about 4 or 5 minutes, the onion was starting to clarify. I then added the potato. Potato can stick with no added fat so I stirred a bit more frequently. This particular potato was a little undercooked so I added it early in the saute; otherwise, if it were done, I'd add it closer to the end to just warm or closer to the midpoint to brown. After about 5 more minutes, I added the mushroom and cooked another 2 minutes or so. The potato had been sticking for a few minutes; I added a few tablespoons of coconut aminos and rubbed the pan with my spatula, almost instantly "cleaning" up the pan. I then added the broccoli and stirred for 2 more minutes. I added the bell pepper, bok choy, and second pile of onion and stirred for a final 3 minutes or so, then served with some more coconut aminos and hot sauce. I also made nutty Himalayan red rice (1 part rice, 1 1/2 parts water, one vegan bouillon cube, all simmered for 20m) and a heirloom tomato salad with chopped fresh basil, a bit of onion, salt and freshly ground black pepper. Dinner came out well. I had forgotten, but a little ginger would have been great in this kind of a dish. I'd like to try cooking tofu in my pressure cooker; I wonder if I make a sauce and let vegetables and tofu (maybe already cooked crisp or just raw) marinade in it for a while and then pressure cook the ensemble if it would be tasty. The tomato salad was good, but some kala namak would have been a better choice than regular salt. 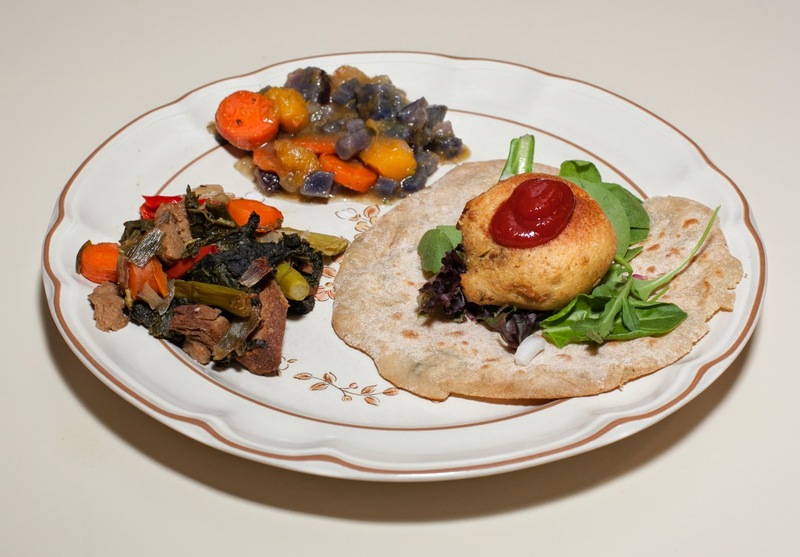 A local startup called The Purple Carrot is trying out a great idea. They will deliver refrigerated boxes with all needed ingredients and a large color recipe card with a photograph of the dish for low fat plant-based meals. I'm helping in a trial run, and received a box yesterday with three dishes. I made one tonight, Mexican Polenta Bowl. It is from Dr. Mary Clifton and Tess Challis' book Get Waisted. I let the polenta get fairly firm, so was able to serve it on a plate and not in a bowl. I have never made polenta from scratch. Today I did! I don't think I should repeat the recipe as I don't see it on the Get Waisted website, but let me describe their polenta.This recipe calls for combining a cup of dry polenta with 4T nutritional yeast, 1t sea salt, and 4 cloves of minced garlic. 4 cups of water are put in a large stock pot, then the polenta mixture is slowly added while constantly stirring with a whisk. Then the pan is heated over medium high while still constantly stirring and brought to a boil. It is then simmered, again while stirring, on low heat for 3-5m till the polenta is thick. It was almost magical how the polenta, initially so liquidy, came together suddenly, it seemed. The dish came out great, and I love the idea of the business! 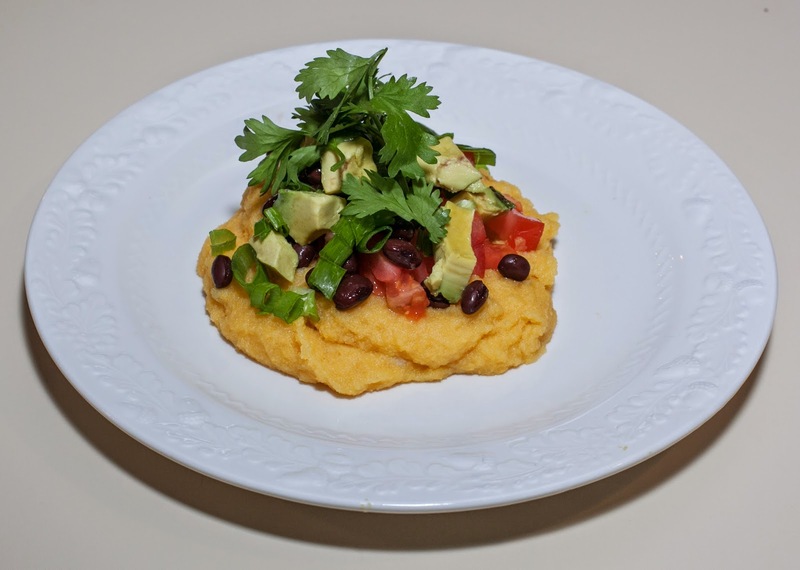 The polenta is served topped with tomato, green onion, black beans, a bit of lime juice, jalapeno, avocado, and cilantro. It was great! If nothing else, tonight's dinner unlocked in me the desire to cook with polenta. I've used prepared polenta tubes, but I see now that they have just a shadow of the flavor that polenta can have. Sauteed mushrooms would go great with a polenta dish like this, as would salsa. I loved the fresh vegetables atop the polenta in this dish. Some fresh uncooked corn kernels would be good. For my daughter, I might add a bit of vegan cheese on top, as well. Crispy seitan, maybe lime marinated jerk seasoned, would be great with a dish like this in the future. This dish is a winner! 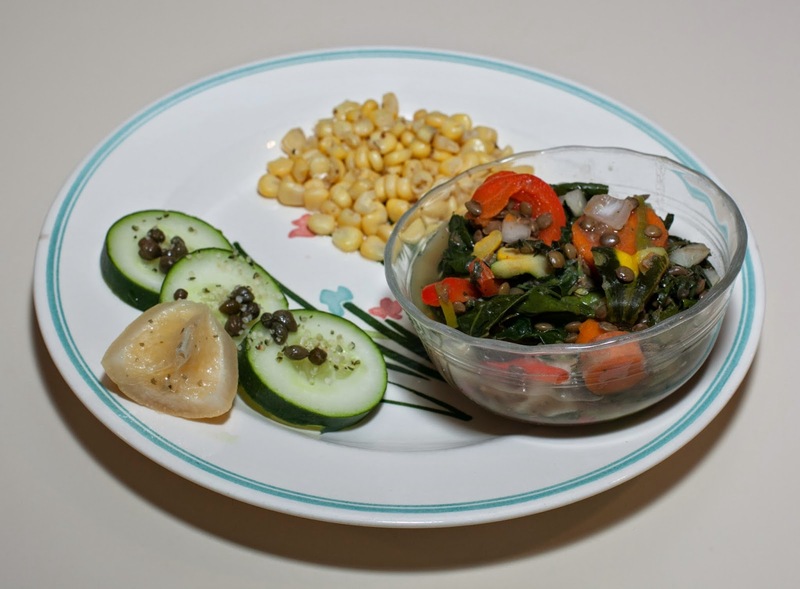 I wanted to try a waterless meal with a few vegetables that I had on hand. Waterless cooking involves a high quality pan like my Saladmaster ones which have a top that gives a seal, but includes a little vapor release. The pan is preheated, the vegetables put in, the pot covered, and, with medium heat, within a few minutes steam should start escaping. At that point, one slow cooks by reducing the heat till the vapor release stops "dancing" and continuing to cook covered for about 20m. No water or broth is added to take nutrients out of the vegetables. I also used a vegan sausage by Field Roast that has about 10g of fat per link. Sometimes when I use this sausage, each person gets less than a link so I can justify an "almost no added fat" description, but, since a whole sausage was included per serving, I won't call this "almost no added fat". Here is what I did. 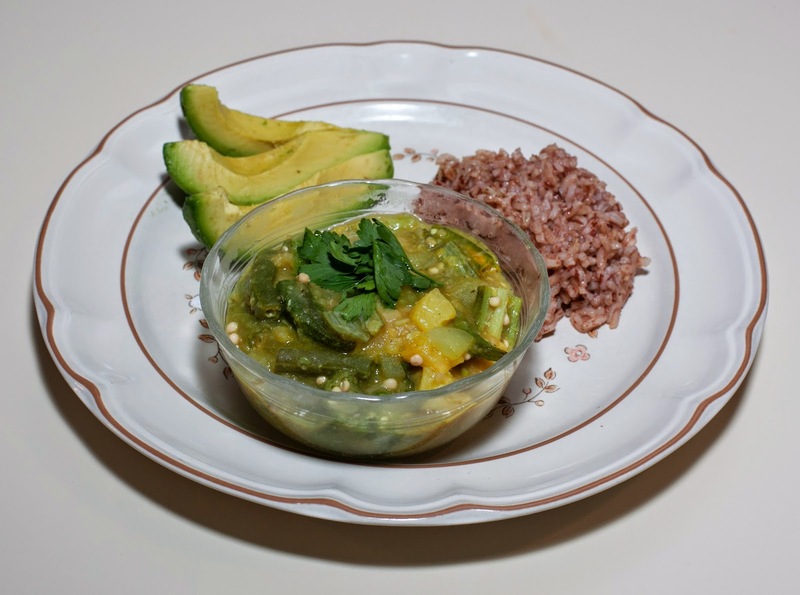 Waterless cooking is a great idea but I needed to have used more flavorful vegetables. The green garlic slices remained tough. I thought that the meal was reasonably tasty, nevertheless. Instead of green garlic, onion would cook better waterlessly. Broccoli, spinach, Brussels sprouts, and other vegetables would be good additions, as perhaps would be some tomato or tomato sauce. Our refrigerator was needing replacement and today was the day that we took delivery of a new one. We tried to eat down some of the fresh produce as we were preparing to empty the old refrigerator, but I had salad ingredients, onion, and frozen peas readily available. I wanted to make another lentil dish with my Dad's needs (no leftovers, no garlic, soft food, ideally with Indian spices, and, of course, nutritious) in mind. This is what I came up with. It takes 15-20 minutes for green lentils to cook in the Instant Pot, and I wanted to be sure that they were nice and soft. Vegetables like asparagus, peas, and corn take only 1-2 minutes. I wanted to have a nice and soft lentil stew for my Dad, so cooked the lentils in a 1:4 not 1:3 ratio. I put all of the ingredients except the onion in the Instant Pot and cooked on high pressure for 20m. I figured that way overcooking the corn would nicely soften it for my Dad, and wondered if the corn would perhaps liquify (it didn't). When the pressure cooker was done, ideally I would have waited for the pressure to diminish to open the pot, but I didn't have much time. I put a damp towel on the top for a few minutes to hasten cooling, then slowly released the steam till the pot was unlocked. I carefully opened the pot, keeping any steam to be released at the back. I had originally thought that I would now add peas, but loved the look of the dhal, so called it "done"! I also made some Madagascar pink rice and served a salad including hearts of palm. The dhal was better than I expected! The corn wasn't overcooked (which I don't understand) and the soup was nicely seasoned, just with the turmeric and salt. I thought that the consistency was perfect, though I diluted it 1 : 1 with boiling water for my Dad. 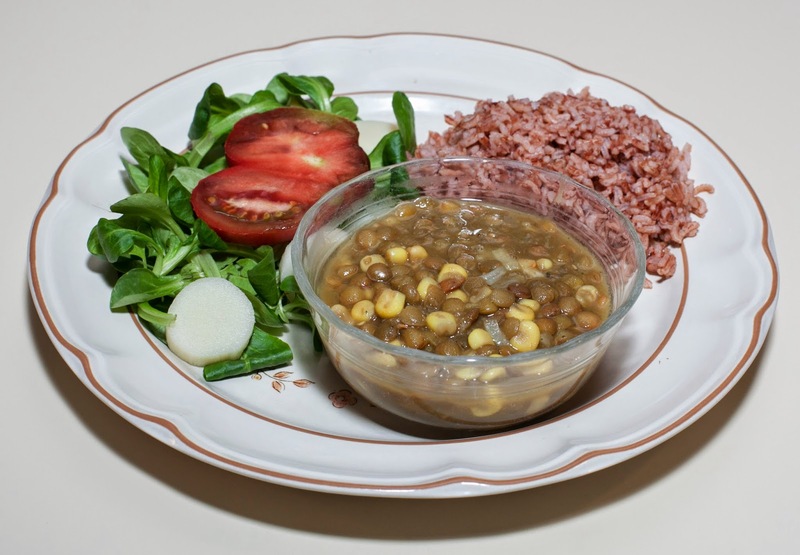 Corn and lentils - who would have guessed?! I need to explore more things to do with corn and lentils! My Dad is visiting and particularly likes red lentils, so I picked up some red split lentils. Conventionally, they cook in a 1:3 ratio of lentils to water over 30-45 minutes. In my Instant Pot, the time is 15-18 minutes. 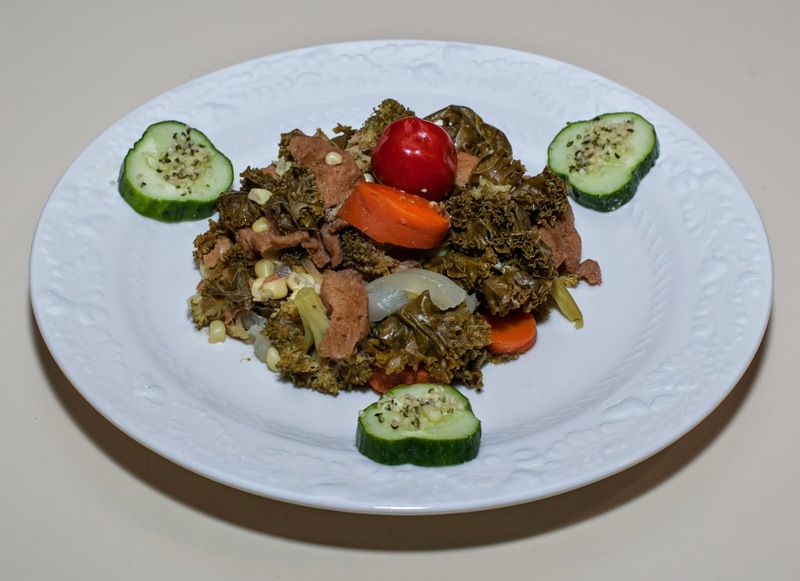 Rather than put other vegetables in for the duration, I thought that I would cook the lentils for all but 4 minutes; I used vegetables that take 2-3 minutes time to cook but, to be sure that everything would be soft enough for my Dad, I gave them 4 minutes. This was the first time that I had cooked lentils under pressure; I was interested to try them at this point, and they actually seemed done and tasty, but rather thick. I know that the added vegetables would contribute moisture, but, to be sure, I added another 1/3 cup water (as in the ingredient list). I'll have to research a bit more about cooking lentils in a pressure cooker. I was originally thinking of a thicker stew, but it was really the right consistency and best served in a bowl. My intuition was right about the water! I also made some Madagascar pink rice. My wife and I enjoyed the dish! At first, my wife, who was brought up in India, thought that the okra didn't go so well with the main course, but after eating a few bites, changed her mind. I made this dish particularly with my Dad's preferences in mind; he needs soft food with little spice, so I thought that the okra would add a bit of chewable texture. My Dad thought that the dish was "okay" but certainly not up to my Mom's standards! I was pleased with how versatile the pressure cooker was in preparing lentils. I'd like to try similar dishes with other vegetables, such as perhaps eggplant and/or carrot. It would add a nice accent to serve with some raw or almost raw onion, as well as some fresh peas. Tomatoes, cooked or raw, would go well, too, but I avoided tomatoes for my Dad's benefit as he is reducing his acidic food intake. I made a very simple meal tonight. 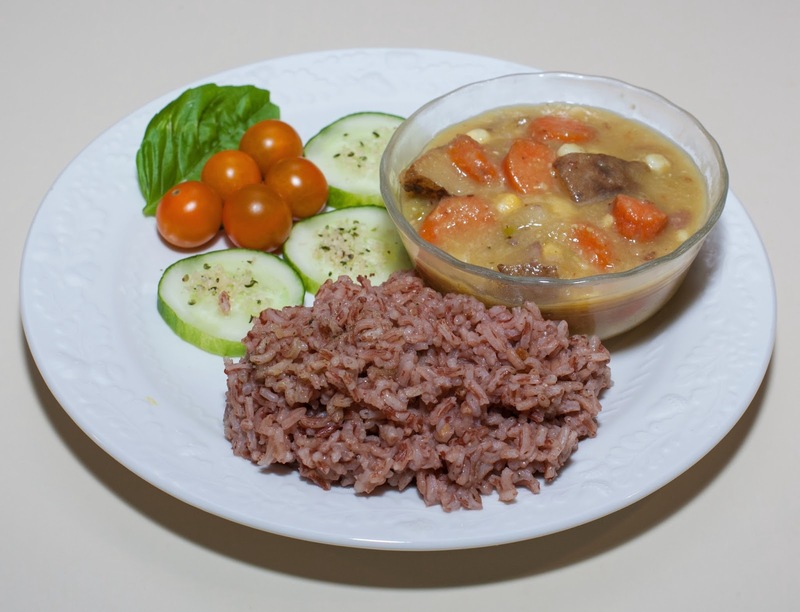 I had made some soft vegetables as a stew for my Dad in the Instant Pot. For the rest of the family, I want to use up as much as I can from our freezer as we are going to have to empty it for Friday's delivery of a new refrigerator. I don't often use convenience foods, but do usually have a few in stock for strange times perhaps when I am hungry before a class that I'm teaching and want to have something that can be quickly prepared. I had some Indian batata wada (Maharashtrian potato fritters) that I heated and served with a salad on homemade paratha that my wife had made, along with the leftover from what my Dad couldn't eat of his vegetables, plus seitan leftovers from a few days ago. It was simple but filling and tasty. My Dad is home from the hospital! It was not a surprise that the doctors recommended a diet like we eat - low-sodium and low-fat, though he has to also be careful of acidic foods. On our way home, my wife made a simple lentil soup (dhal) for him. I wanted to make a mushroom waterless dish for us. This is what I did. I also sauteed some tempeh with red onion bulb and shiitake mushroom without oil, mixed in a bowl with mâche rosettes, hot sauce (since my daughter and father weren't eating this), and coconut aminos, and served as a side dish. Some Jade pearl rice with a bit of onion and the other half of the zucchini, cubed into 3/8" cubes, that I had first sauteed completed the meal. The main dish was a bit too bland. I like the waterless cooking idea, but should have had additional flavor in the vegetables, such as including maybe beet or carrot, as well as seasoning. The tempeh dish was good and we love Jade pearl rice. My Dad liked his simple dhal and crackers; I look forward to seeing his appetite grow. 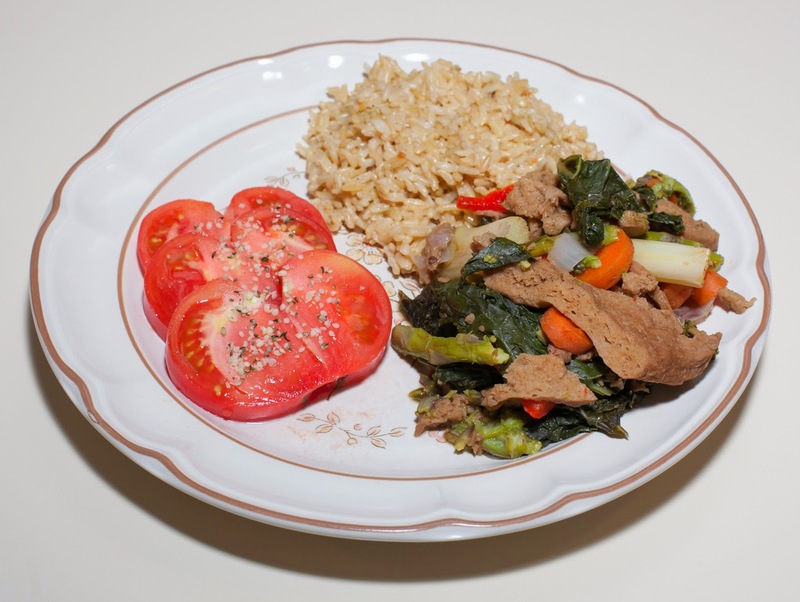 I need to be sure that I use especially flavorful vegetables when cooking waterlessly, or mixing the finished vegetables with something crunchy (like raw vegetable shavings) or otherwise textured (maybe seitan). I have been thinking of making pasta in my Instant Pot and envision a recipe where I cook penne or other small pasta along with sauce, and hope for no splattering by cooking at low pressure. 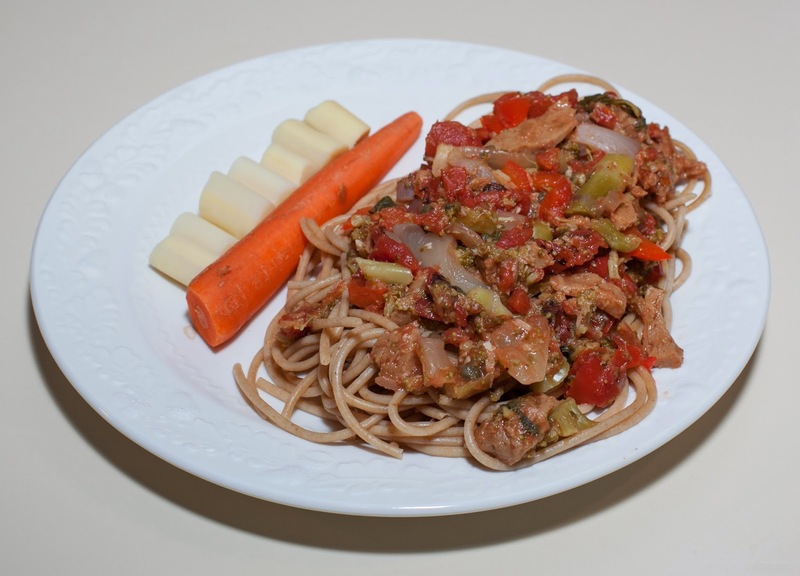 One recipe I have found is Tim's Pressure Cooker Pasta, but I wanted to try this in baby steps. Today, I thought I'd first roast an onion and some garlic cloves, then add tomato and do a saute in-pan. My Dad is still in the hospital but seems to be doing well. He will likely have to eat less acidic food, so that triggered me as well to do a pasta experiment tonight. Here is what I did. How could one go wrong with such good ingredients? The pasta was good and hearty. I love what the pressure cooker did to the onion (soft and mild in flavor) and garlic (hardly noticeable so a good way to get nutritional benefits of garlic without a lot of strong flavor; some fresh garlic added to the saute could have added more flavor punch, if desired. The broccoli, as well, benefited by pressure cooking by being soft and blending in nicely with the sauce. 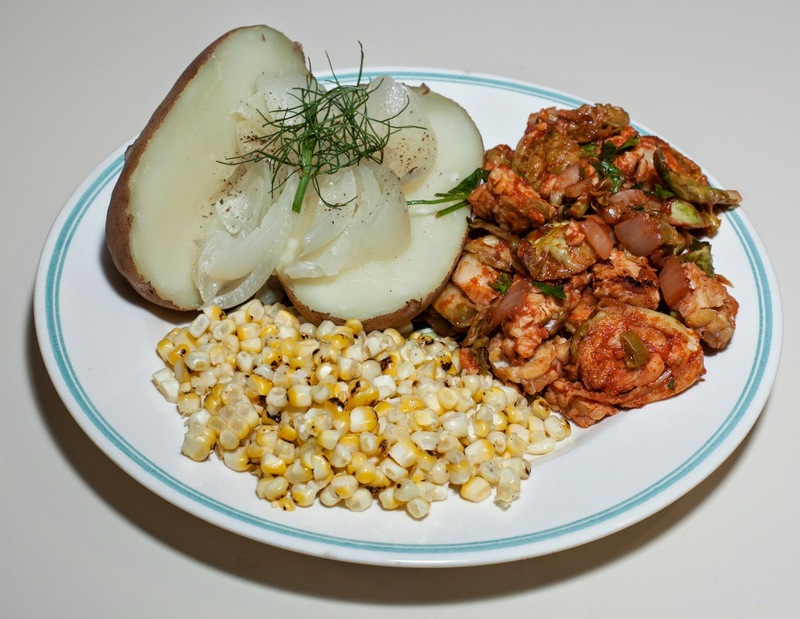 The sauce, obviously, would be even better, at least to my taste, with some crushed red pepper simmered with the ingredients but I keep low on such heat because of my daughter (I did add crushed red pepper when I served to my wife and me). I could experiment with adding additional vegetables to be pressure cooked, such as artichoke, squash, and even carrot. The seitan was nice and some vegan sausage would be even better, like the Field Roast apple sage or Italian types. I can't wait to experiment and figure out how to cook pasta start to finish, noodles included and without much splattering of sauce into the top of the cooker, all in the Instant Pot. I have been excited about waterless cooking especially over the past month or so (see my explanation from May 11th). I decided to make a main course using this healthful technique. I have been wanting as well to experiment with my Instant Pot in making brown rice. I believe that pressure cooking is less sensitive to the actual rice : water ratio, with more water resulting in a stickier rice and less water in a more fluffy rice. I like fluffy, so thought I'd try making rice with a bit less water than the 1 part rice : 2 parts water ratio and 50m way of traditionally cooking rice. I put the kale, asparagus, onion, bell pepper, carrot, and seitan in a 3 quart Salad Master stainless steel stock pan, ensuring that the pan was nearly full. I covered the pan (in hindsight, I could have first warmed the pan then added ingredients) and heated on medium high till I heard the vapor lock clicking. I then immediately reduced the heat to a low enough heat that the clicking just stopped, and cooked for 20m. I turned the heat off, opened the top, and mixed in the remaining ingredients. I haven't cooked brown rice in a long time. 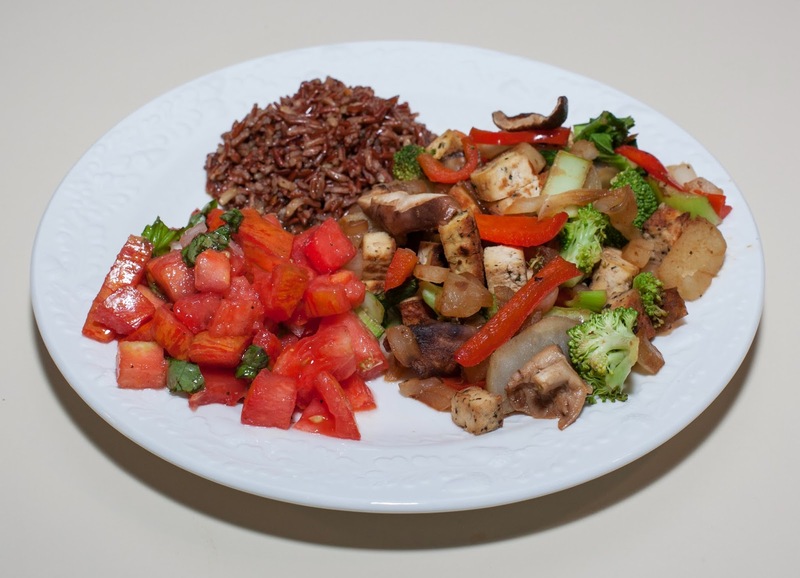 I more typically use other whole grain rices like Madagascar pink, or brown and wild rice blends. Surprisingly, even on high, pressure cooking just reduces the time of cooking from 50m to 40m. I didn't measure, testing how easy it is to quickly make brown rice with little effort, and added approximately 3/4 cup of brown rice to the Instant Pot. I could have also added a vegan bouillon cube, but just added enough water to more than cover the rice, but not be twice as much by volume. I selected the "Multigrain" button, which gave me a 40m high pressure cook. When the 40m were up, I let the pot slowly cool down, finally gently releasing remaining steam when I needed to serve. Unfortunately, my Dad, visiting for a few weeks, wasn't feeling well and ended up in the hospital yesterday. He's stable and should be home within a few days. He wanted a little bit of food from home, and asked for mashed sweet potatoes. Sweet potato cubes are supposed to take about 7-9 minutes to cook in high pressure in the Instant Pot. To be sure they would be soft, I cut a sweet potato into 1 1/2" or so cubes and cooked with about 2" of baby red onion stalk cut into 1/4" pieces, along with about 1/2 cup of water, on high for 10 minutes. Mashed, and they were ready for my Dad. I loved dinner! 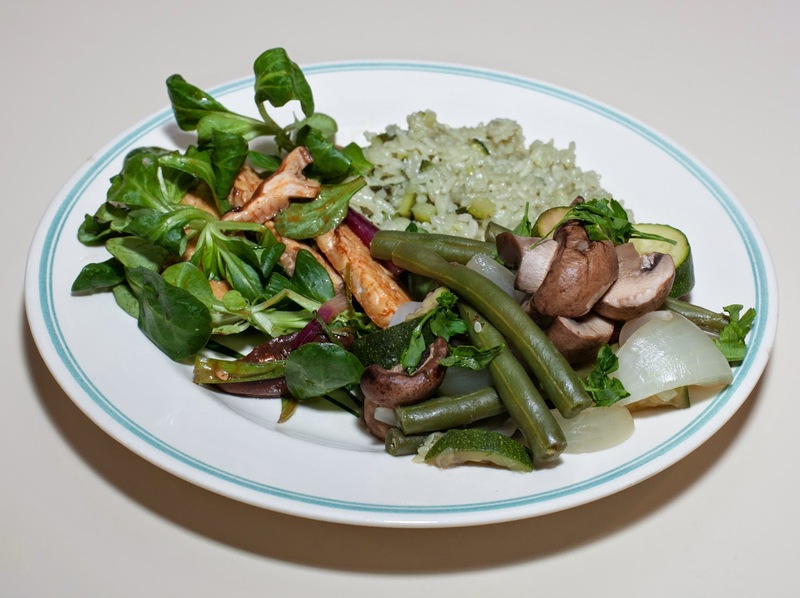 The vegetables were so tasty and even the thicker portions of asparagus were nicely cooked. I need to more regularly cook waterlessly. I really liked the rice, too! It was indeed fluffier and somehow tastier than when I cook it in a rice cooker (surprise!) or in a standard pot. Maybe indeed pressure cooking will have me replace my excellent Zojirushi rice cooker? The sweet potato came out well. I'll have to make mashed sweet potatoes for my wife, daughter, and myself. I want to continue to experiment with brown rice in the pressure cooker so that it really does become a quick "throw it together" technique that does not require measuring. I should try a batch with an excess of water to see how the rice turns out. We were in a bit of a rush for dinner tonight. My wife had a meeting about her interesting Meet at Park application and my daughter and I were going to a book launch of our friend Carl Nordgren's first published novel, The 53rd Parallel. Thankfully, we have the Instant Pot to put a quality dish together quickly. I wanted to try cooking with frozen squash. We all like seitan, and it's been a little while since I've cooked with it. Here is what I did. I was surprised that the Instant Pot cooking time chart shows about 10m for frozen butternut squash chunks; I would have guessed much less. In any case, I put the squash, shallot, onion, mushroom, bouillon cube, water, and salt into the Instant Pot and cooked on high pressure for 10m. Ideally, I would have waited 10m or a bit more for the pot to come down in temperature so that the pot could naturally depressurize, but my wife was running late for a meeting, so I slowly reduced pressure after a few minutes by gradually slowly opening the pressure release valve. Once the pot was open, I added the rosemary and seitan, and stirred. I let the pot sit for a few minutes to allow the seitan to warm, then served with hot sauce. I also made some Jade pearl rice, perhaps now my favorite type, even more than Madagascar pink - it just comes out so creamy and tasty! I briefly sautéed in a 1 quart stock pan a bit of slivered onion with no added fat just for a minute and a half or so, then added a part of rice to a part and a half of water plus a vegan bouillon cube, brought to a boil, then reduced heat to simmer over low heat for about 20m. A slice of yellow tomato completed the meal. My wife, daughter, and I loved the meal. My intuition, however, was right - the squash was overly cooked. It wasn't a problem, but could have been made in less time, using less energy, and resulting in more texture. A bit of ginger and jalapeno would be great, added along with the squash and other ingredients initially. My daughter doesn't like either, so I left them both out. This dish could have cooked in much less time. I'd like to try cooking with frozen butternut squash cubes in maybe 5m of high pressure cooking time. I could have gone with a bit less water, perhaps 1/4 cup. However, the liquid was tasty and would make a good gravy. I fed my daughter a little earlier, so made dinner tonight just for my Dad, visting for a few weeks, wife, and myself. I thought that I would make a baked potato in my electronic pressure cooker to accompany a vegetable sauté. I also made baked potatoes. I followed the same recipe that I did on May 21 for baked potatoes, but increased the cook time to 17m to ensure soft potatoes for my Dad. For fun, I thought I'd take a medium Vidalia onion, remove the skin and very top and bottom, and put it atop the potatoes for the cooking, as well, wondering if the onion would roast and partially liquefy. I also flame roasted three small ears of organic corn, stripped the kernels, and served with a bit of salt and lime juice. Dinner was good! The Brussels sprouts came out well and I think were reasonably seasoned. The potato was probably the softest potato I've had; it was great for my Dad and fine for my wife and me, though I'd prefer a minute or two shorter cook time if not cooking for my Dad. The onions indeed came out soft and mild, like roasted onions. I simply chopped them up and served them on the potato. How could the corn not be good?! I am so happy that I tried this onion experiment. I'd like to use onion in this way in the future, and perhaps combine it with the "nacho cheese" sauce that I described on April 22.